Starting something new is daunting. Whether you’ve thought about beginning your own charity, not-for-profit, NGO, community group or social enterprise, knowing where to find reliable resources to guide you on your first stages of the do-good journey can be confusing and disheartening. At The Ākina Foundation, we’ve seen many young social enterprises blossom into prosperous, functioning businesses that benefit their communities and generate positive global impact. Social enterprise provides a means to improve social well-being, environmental sustainability, and economic performance. They are purpose-driven organisations that trade to deliver social and environmental impact. Through trial and error, we’ve broken down these early stages of business development into a series of steps to take the stress away from those who are still finding confidence in their vision. We call it the Social Lean Canvas, and it consists of nine steps that ensure the foundations of your venture withstand many of the challenges new businesses face in the first stages of operating. The points outlined below will aid you in the first few steps of the journey, and help you to create a Social Lean Canvas of your own! We recommend you draw it out in boxes on paper, it gets the brain juices flowing and you can pin it up on the wall to remind you of where you’re heading. The first step in building a Social Lean Canvas is to start with the customer, because every business model needs customers to survive. The customer box needs to include all the key people you need to move to make your social enterprise work. Not all customers need to be paying you, but at least one segment will be. Groups who might end up in this box include customers, funders and end-users. Next, we jump to the opposite side of the canvas and look at the problem box. Customers and problems come in pairs. If a customer doesn’t have a problem we think we are solving, then we need to rethink their role in our business model. We also phrase our customer’s problems in their own words, which helps us understand where they are coming from. The other reason we do this is because it is important that this is actually a problem the customer faces. If our customer doesn’t think they have a problem, then it’s going to be challenging to convince them that they do. Cafe Customers – I need a coffee and I don’t want to buy it from a generic chain store. Young people – I feel like I don’t have a future because no one will give me a job. After looking at our customer’s problems, we need to think about how we entice them to engage with us. We do this by crafting a unique value proposition (UVP). The UVP is the benefit you offering to your customers, not the features. For example, a movie theatre might have the biggest speakers in town, but you don’t go to that theatre because of the exact size of the speakers. You go because you want to feel it when the alien spaceship crashes to earth. Each customer will have a matching value proposition because they each have individual problems you are solving for them. Often the UVP will be a reframing of the problem expressed by the customer. Cafe Customers – Unique coffee that makes you feel good and the world a better place. Young people – A place that gives you a chance and a future. Government – An opportunity to change the lives of young people and better spend tax dollars. Once we’ve done the UVP, we can propose a solution. This solution is the business we think we are going to create. We need to keep the solution reasonably high-level and clear. We also need to remember to hold our solution lightly. As we work through our canvas, we may find that we need to change our solution based on what we learn. Our solution is a cafe that employs people with no work experience who are struggling to get into the workforce. We are going to provide them with training on the job, and then help them get a job in hospitality so we can continue to train new people. Each social enterprise needs an unfair advantage. This advantage is the thing that will make you succeed where others have failed. Your unique advantage might be a world expert on your subject matter, a celebrity, or a patent. Knowing your unique advantage is vital because it will be a key part of getting other people on board with your vision. It will also be the thing that makes your venture different from all the others out there. As you establish and grow your venture, you’re going to need to measure some key factors. Knowing how you are going on these key factors will help you assess whether you are going in the right direction. When choosing key metrics make sure you choose metrics that actually tell you something, rather than just ones that make you feel good. You shouldn’t only be measuring new customers, but also how many customers you are retaining over time. You will also want to have some measures that indicate how well you are achieving your impact. For example, you might want to count how many people you are training, or helping, or what changes occur in your end user’s lives. In the channels box, you will list the routes you use to market and sell to your customers. This might include online, face to face, or via distributors. Different channels have different impacts on your business model. For example, a business that only sells through its own website will have very different cost structures and personnel needs compared to a business that sells door to door. With a clear idea of what our solution is, we can start to look at how the business works financially. This is pertinent to social enterprise, where net profit is the aim. There are two key areas that affect the finance of a business; how much money comes in and how much money goes out. We break these into two different boxes, costs and financial sustainability (revenue). In the costs box, you need to think about what the set-up costs will be and what the ongoing costs will be. In the financial sustainability box, we put down all the sources of income we will have. It’s best if you can put actual numbers in these boxes. The numbers don’t have to be exactly right, but if you put in a rough approximation, you can start to work out how viable your business looks. Err on the side of caution and assume that your costs will be higher than you think and your income will be lower than you think. For our cafe example, we might have to spend $250,000 on fit-out and equipment before we even start. If it’s not going to be possible to find that much money we might have to think about an alternative solution that still fulfils our purpose. Also, if we know that we can only sell a coffee for $3 in our town, but it’s going to cost us $4 in training and ingredients then we would need to be sure that the government training grant would cover the difference. 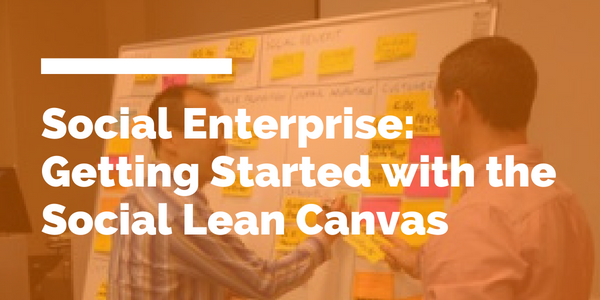 Those are the nine steps in our Social Lean Canvas to get you started. Getting started is one of the hardest parts of your social enterprise venture, but seeing a tangible impact on your community makes these initial stages worth every lost hour of sleep! Visit www.whare-aki.org or www.socialleancanvas.com for further resources to aid you in your do-good journey. The Ākina Foundation is New Zealand’s principal intermediary for social enterprise and have been named the strategic partner to Government in the development of the Social Enterprise sector. At Ākina, we believe that social entrepreneurs and social enterprise are key to building an economy that regenerates the environment and creates social foundations for our people and communities to thrive. We also work with civil society, government, business, and philanthropic partners to advance strategies and broader thinking that relate to social impact, innovation, and inclusive economic development. Keen to write a guest post on Do Good Jobs? We are always looking for relevant content from Kiwi charities, or on employment related themes. Find out more here! A variety of our all time fave reads on purposeful-driven work and careers (via Fishpond).